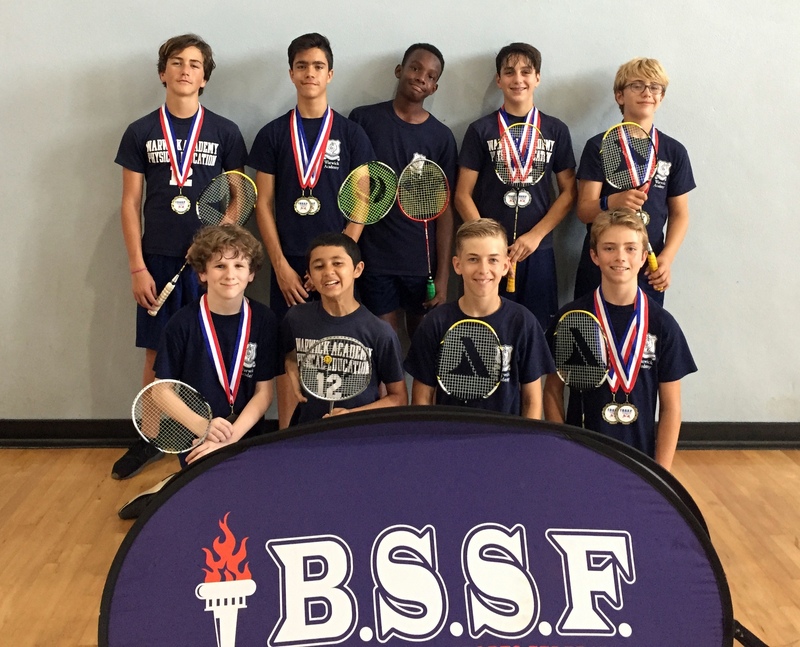 Warwick Academy swept all four Divisions in the Bermuda School Sports Federation Middle School Boys Badminton Tournament. The first medals awarded were in the Under 13 Singles Division, Noel Johnston finished the day undefeated and had little trouble defeating Mount Saint Agnes top seed Jacob Roberts in straight games 11-1, 11-4. Johnston defeated Warwick second seed Mathew Brookes 11-5 in their Semi-Final, while Roberts defeated teammate Jake Roberts 11-5 in the other Semi-Final. In the Quarter-Finals, Johnston defeated MSAs Drake Kucharik 11-4 while runner-up Roberts got by Xavi Lee 11-7. Brookes defeated Antoine Warner 11-9 in an all Warwick Quarter-Final with Jake Roberts defeating Warwick Charles Boisvert 12-10 in the final Quarter-Final pairing. Johnston and Boisvert teamed up to win the Doubles Tournament over the MSA pair of Jacob Roberts and Kucharik. The champions were tested winning in straight games 11-9, 16-14. The champions got past MSA pair of Mataeo Holder and Jake Roberts 11-4 in their Semi-Final while the runners up from MSA edged past Brookes and Warner from Warwick 11-8. In the Quarter-Finals Johnston and Boisvert knocked out the Somersfield Academy pair of Charles Lightower and Aiden Wells, while Roberts and Holder defeated Saltus pair Martin Grant and Jonah Faria 11-7, Brookes and Warner defeated the other Saltus team of Cole Packwood and Moses Johnson 11-2. Kucharik and Roberts then ended the Quarter-Finals with an 11-7 win over Xavi Lee and Andrew Tobin. All four Warwick students made the Semi-Finals in the Over 13 Division but it was number one seed James Lockham who won the Gold after an 11-3, 11-3 win over Ryan Daniel. Lockham defeated Finn Moseley while Daniel defeated David Goonewaedene by scores of 11-6 in the Semi-Finals. All four Warwick players won with relative ease in the Quarter-Finals with Lockham getting the better of Nick Kempe from Somersfield Academy 11-7. Moseley also had an 11-7 win over MSAs Jacob Hodder. Goonewaedene easily got past Somersfield Academy’s Mackai Whitter 11-1 and Daniel picked up an 11-3 win over Saltus’ Max Derios. It then came as no surprise that Lockham and Moseley would join forces and face the Warwick pair of Daniel and Ben Floyd in the Doubles Final. This was the tightest match of the day with the Lockham-Moseley pair recording a 12-10, 8-11, 14-12 hard fought win. The champions defeated Saltus pair Sam Ferson and Ben Osset 11-5 in their Semi-Final, while Daniel and Floyd defeated the MSA pair of Owen Botelho and Jacob Hodder 11-5. In Quarter-Final play the Lockham and Moseley defeated Whitter and Daniel Ringer of Somersfield 11-8, while Osset and Ferson got by the other Somersfield team of Kemp and Mikey Costello 11-5. Botelho and Hodder defeated Saltus pair Derios and George Kerr 11-9, with Floyd and Daniel defeating MSA duo Rico Cabral and Caleb Cook 11-8.